The Northern Jaguar Project asked AZGFD for help in confirming the identity of a jaguar killed in Mexico. Our biologists compared photos of a cat that visited the Huachuca Mountains in 2016 and 2017 to the photo of the jaguar pelt, and determined it was the same animal. PHOENIX – A photograph analyzed by the Arizona Game and Fish Department confirmed that the last jaguar to venture into Arizona was killed recently in Mexico. 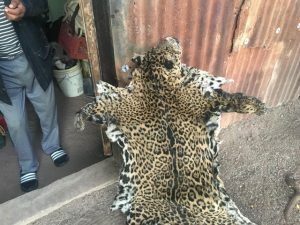 A photo of a jaguar pelt, sent by the Northern Jaguar Project, was independently analyzed by six Arizona Game and Fish (AZGFD) biologists to see if the pelt’s spot patterns match photographs of a cat last seen in Arizona in May 2017. All six biologists concluded it was the same cat. Like human fingerprints, every jaguar’s spots form unique patterns, and by isolating and reviewing photos of the spot patterns, AZGFD biologists were able to find exact matches between photos of the pelt and trail camera photos taken when the lone male jaguar crossed into the United States some 18 months ago. Jaguars are only occasional visitors to Arizona and no female jaguar has been seen in the U.S.
since the 1960s. No jaguars are currently reported in Arizona, and according to deVos, there is little likelihood they could ever re-establish a presence here. 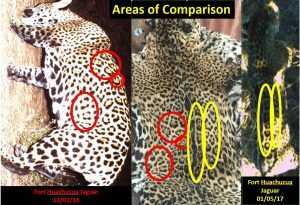 AZGFD biologists looked closely at these jaguar spot patterns to determine all these photos were from the same animal. AZGFD continues to work closely with our international partners to conserve and recover jaguars. Arizona may now be too populous to provide good jaguar habitat, but AZGFD remains committed to helping conserve this important species. The Department works closely with Mexican scientists and wildlife officials throughout the Americas to collaborate, study and conserve jaguars populations. In fact, at the “International Jaguar and Wild Felines Symposium” last month in Cancun, Mexico, AZGFD was the only U.S. entity invited to attend. “Arizona is on the far northern edge of jaguar territory, and not many actually come here, but we still recognize jaguars as an important species that must be conserved and protected,” said deVos.